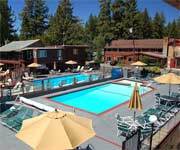 Features: Mourelatos Lakeshore Resort Lake Tahoe is a family-run business that has owned the property since 1978. 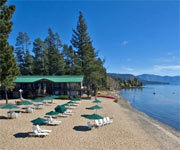 Mourelatos Lakeshore Resort Lake Tahoe provides lake front accommodations in an incredible location right on the lake. 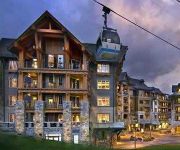 Mourelatos Lakeshore Resort offers a number of recreation and leisure amenities. 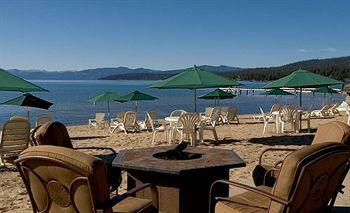 Why We Stay: Mourelatos Lakeshore Resort Tahoe has a private sandy beach for hotel guests. 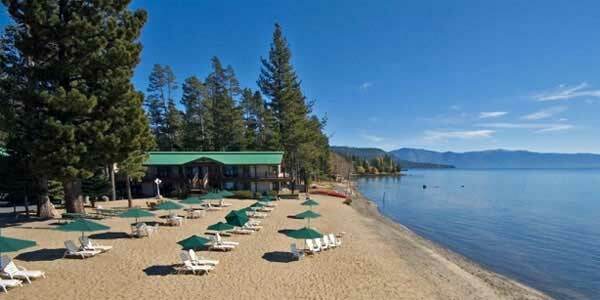 Mourelatos Lake Tahoe Resort also has all kinds of outdoor recreational toys for guests: an aqua glide water trampoline, beach ping pong table, frisbee golf beach basket, beach volleyball, badminton and other beach and water toys. The Private Beach: Guests will have all the equipment they need to enjoy the 275-foot private sandy beach. Mourelatos Lakeshore Resort supplies guests with beach chairs, hammocks, umbrellas, BBQ grills, picnic tables, ice machines and two beach fire pits. Jet skis are also available for rental at the beach. The Hot Tubs: Mourelatos Lakeshore Resort features two outdoor hot tubs that are open for use all year long. The Private Trails: Mourelatos Lakeshore Resort in Tahoe Vista has 18 acres of private trails right across the street from the hotel. Perfect for Lake Tahoe adventures year-round, enjoy hiking, snowshoing and cross-country skiing on these fun and beautiful trails. 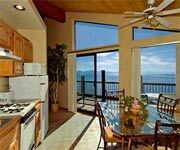 Inside Knowledge: During the winter, guests at Mourelatos Lakeshore Lodge Tahoe Resort are treated with a complimentary continental breakfast on weekend mornings. 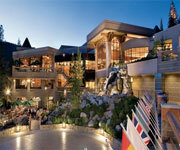 Do Stay Entertained: Mourelatos Lakeshore Tahoe Resort has an extensive DVD library from which guests can rent movies. 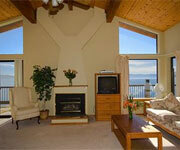 Guests at Mourelatos Lakeshore Tahoe Resort can also play Wii on a large flat screen TV. The group room at Mourelatos Lakeshore Resort also provides a cozy place to watch movies and sports. Do Get Active: Mourelatos Lakeshore Resort Lake Tahoe offers lots of equipment for rent, including one- and two-man kayaks, stand-up paddle boards, paddle boats and captained and non-captained boats. 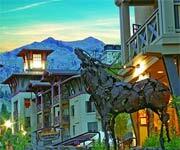 Don't Plan Alone: The friendly concierge staff at Mourelatos Lakeshore Resort Tahoe can help you plan your activities. 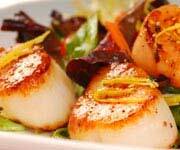 When you're confused about where to go or what to do, Mourelatos Lakeshore Resort Lake Tahoe concierge staff can suggest dining, recreation, sightseeing, shopping and local events. Don't Leave Your Sweet Tooth Unsatisfied: The ice cream shop at Mourelatos Lakeshore Resort in Tahoe Vista serves Bud's Ice Cream from San Francisco. This is actually a really tranquil and relaxing place to chill out at. Seems like a really nice couples spot. 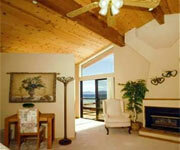 The rooms have vaulted wood ceilings, fireplaces and a couch. They’re really spacious rooms. You could definitely fit a few people in them. The beds are really nice too. 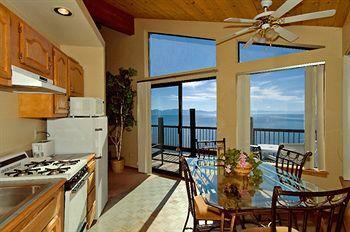 It’s literally right on the water so there are amazing views of the lake from the patio areas! 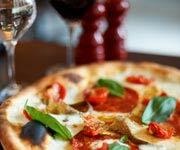 It does have a rustic feel, which I love, but if you’re not up for that then you should look elsewhere. But it really is a common theme all over Lake Tahoe. Also, I have to mention that the staff at the front desk was super friendly! 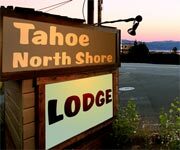 Definitely a great option if you’re looking for a place to stay in North Lake Tahoe. The lakefront room wows guests with stunning views of the water. Guests will be able to enjoy 1 desk, 1 sofa bed and 1 king bed with Egyptian-cotton sheets and a down comforter. 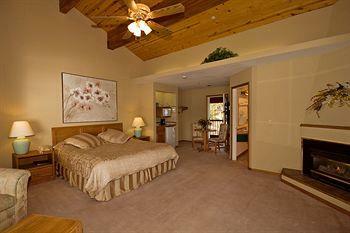 Guests can use WiFi for a fee and wired high-speed Internet access for free in this room. 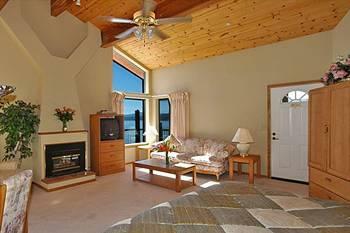 The lakefront room has a flat-panel HD TV, a direct-dial phone and a CD player. The kitchen has a stovetop, microwave, refrigerator, blender, cookware, dishware and utensils. The bathroom features a deep soaking bathtub. Upon request, hypo-allergenic bedding, rollaway beds and cribs are available. This room option is non-smoking only. Guests will have sightlines to the water from the lakeview room. This room option features 1 desk, 1 sofa bed and 2 queen beds with premium bedding. There is a patio from which guests can enjoy the view. The lakeview room offers both wireless high-speed Internet access (surcharge) and wired high-speed Internet access (complimentary). There is a flat panel HD television with premium channels and ESPN, a DVD player and a direct-dial speakerphone. This room has a microwave and refrigerator. The bathroom has a deep soaking bathtub. This room is non-smoking only. 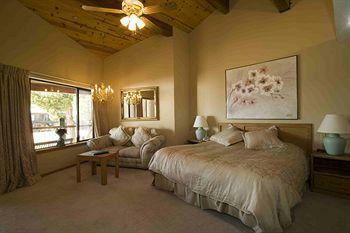 The lakeview room with a kitchen provides guests with 1 desk, 1 sofa bed and 1 king bed with luxury bedding. This lakeview room has a patio and a view. Guests can have WiFi for a fee and wired high-speed Internet for free. Entertainment items in the room include a flat panel HD TV, a direct-dial phone and a CD player. 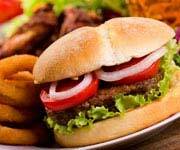 Conveniently, the kitchen has a microwave, stovetop, refrigerator, blender, cookware, dishes and utensils. Relaxation can be had in the bathroom's deep soaking tub. 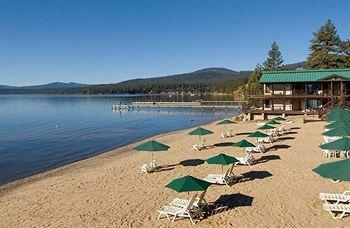 If need,  Mourelatos Lakeshore Lodge Tahoe Resort offers hypo-allergenic bedding, rollaway beds, and cribs. The lakeview room with a kitchen is non-smoking only.